Crawling back to my blog. Do you call that clogging? This past Saturday we were wooed and wowed by Homestead Farms hot dogs at the SFC farmers market at Sunset Valley. I hadn’t even planned on buying meat that trip but Austin Frugal Foodie can’t resist a frankfurter! Homestead Farms raises grassfed cattle in the Waco area and fashions the meat into a selection of charcuterie including cold cuts, which I’d previously purchased at the Austin Farmers Market downtown. The folks running the sales booth are sweet sellers hawking sustainable and tasty Texas beef. A warm sample of wiener was all it took to sway me and I immediately began brainstorming both haute-doggery and plebian preparations. Homestead Farms hot dogs, while not as smooth and homogeneous as mass-market franks, deliver that familiar flavor, so yummy with yellow mustard—I like Central Market organic. Or lots of ketchup—that’s how the kindergartner digs ’em. Here’s an easy and totally fun recipe to enjoy with children young and old. Portable, the finished franks can conveniently tag along to the park when it stops raining. 2 ounces (1/2 stick) organic butter, melted and browned a bit. I love Organic Valley. Click for a coupon. 3 Tablespoons turbinado sugar. I buy this in bulk. Remember to bring your own container and have the staff tare the weight for you. 1 cup local milk. Check out Swede Farm Dairy and Wateroak Farms goat milk. 121 grams (1 cup) organic all-purpose flour. Whole Foods 365 brand in the 5# bag is usually the best buy. 4 1/8 ounces (3/4 cup) organic cornmeal. I generally choose Arrowhead Mills. Grease up three cornstick pans with the lube of your choice. Organic neutral oils, melted butter and pork fat will all work. Preheat the oven to 425°. I use the hot oven to melt and brown the butter. Just put it in an ovenproof saucepan and stick it in there. Remember to grab a potholder before reaching for the pan! Let the butter cool a bit on a cooling rack. Whisk together the sugar, milk, eggs and salt. Whisk together your dry ingredients in a separate bowl. Pour the dry ingredients on top of the wet ingredients and barely combine them using a flexible spatula if you have one. You only want to unite these elements about halfway. Pour your butter over the mess and continue to combine the ingredients just until a few very discernible streaks of flour and butter remain. Don’t overstir. 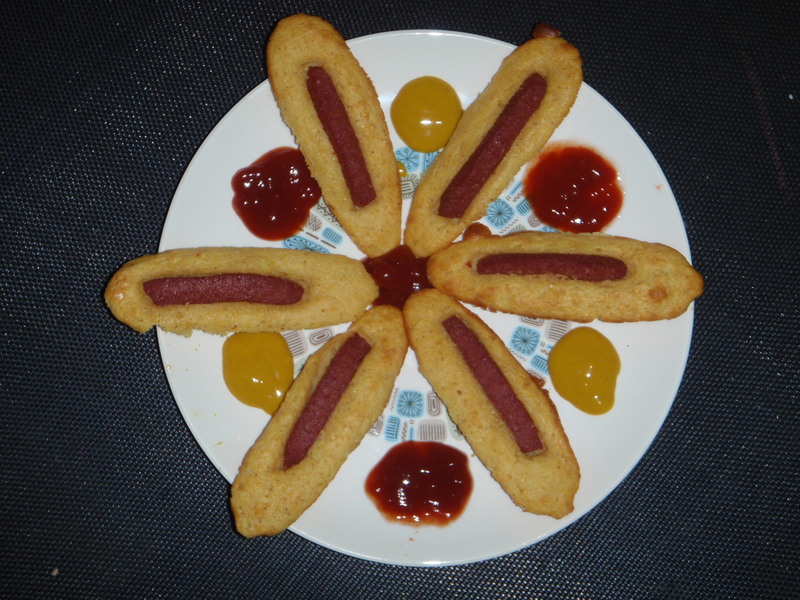 Using a large spoon, fill each cornstick cavity with batter. Place one hot dog strip into each section, skin-side down. Press the wiener into the batter a bit to tuck it in. Bake for about 12 minutes, until the batter is cooked through and lightly browned. Remove pans from the oven and carefully unmold each porkypone, placing them on a cooling rack. Serve with your favorite dog dressin’s! Porkypones taste great at room temperature, too. good greens: good and green! Local beets be ’bout gone, but big ruby beauties beckoned this past Saturday, all coyly coiffed with scarlet-striped greens atop scarlet stalks. Who would dream of throwing away those leafy lagniappes? I save the edible greens from most of my produce: all the root veggies plus kohlrabi, and leek tops go straight into the freezer to await the stockpot. Carrot tops I utilize the least, but I try to get to them as well. 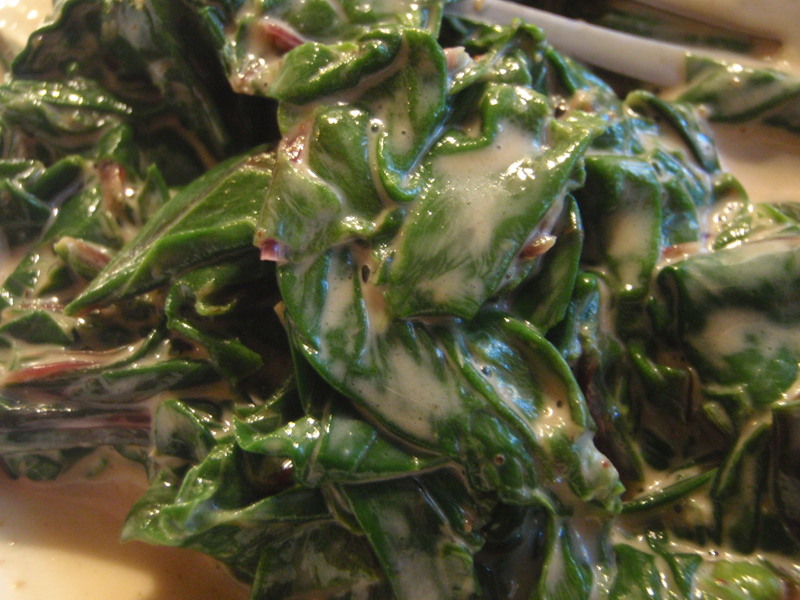 Easy for creamin’, beet greens quickly cook up tenderly toothsome without disintegrating. For my last batch I wilted the rinsed leaves in hot olive oil (Central Market’s organic brand offers a great value or try Texas Olive Ranch for local), added a splash of organic cream (Organic Valley’s my top choice) and a small chunk of organic cream cheese (CM’s own brand is usually cheapest). Seasoned with a dash of garam masala and salt to taste, these greens didn’t even need a squeeze of fresh lemon for brightening at the table, but it’s up to you! Although I try to approach cooking and eating, and life in general, from an eco-friendly angle, thrift has always informed my style. 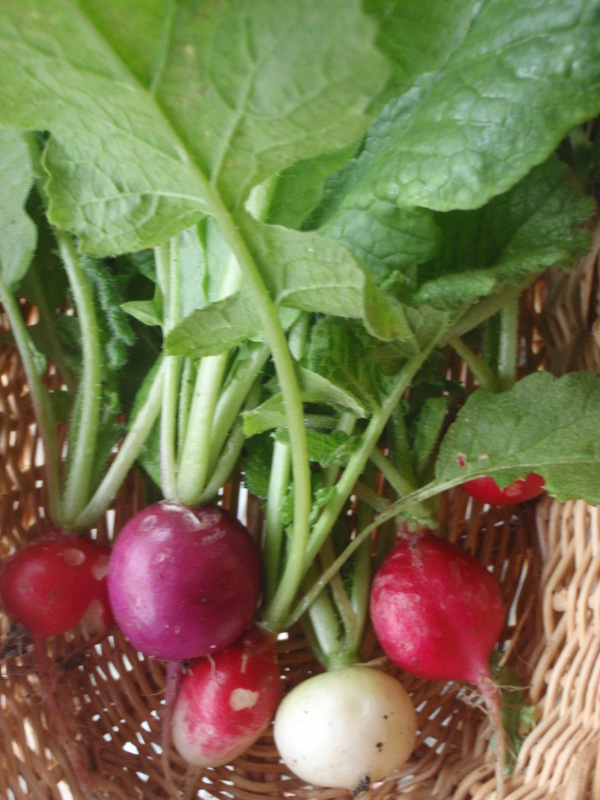 To that end, this blog aims to help folks find, afford and enjoy sustainable foods, i.e. local and/or organic. In this society, where a truly bewildering variety of choices both tempts and confounds eaters, lucky cooks can find themselves overwhelmed by options. Our full cups may runneth over us, laden with delicious novelties from far-flung cuisines. Those less fortunate, the food-insecure, must make do with what they have, when they’re lucky enough to find something in their cupboards. On this happy Sunday morning the toddler let me sleep in about an hour and a half later than usual. I feel nearly human! Coming into the kitchen area, I noticed that our pot of rice, just cooked last night, had been left out. Although the house still isn’t warm at night, it’s definitely not cold. So I put the pot into the fridge, determined to re-cook this rice soon. Nasi goreng-style fried rice coming up! Inspired by last week’s Capital Area Food Bank Hunger Awareness challenge, I’ve been trying, even more than usual, to make use of odds and ends stashed away, maximizing my thrift. Nearly forgotten condiments, combined with cheap seasonal produce, the incredible, affordable egg, and leftover meats or inexpensive soy foods, resurrect abandoned rice. Lubing the lot with a lagniappe of sustainable fats utilizes even more precious foodstuffs that might some folks just discard. Here’s this morning’s fried rice, Indonesian-inflected and fortified with goods on hand. Just a general guideline for creating your own tasty and budget-conscious quick meal. rice, cooked and chilled, I love Lowell Farms Texas-grown organic jasmine rice. Don’t use fresh-cooked rice. organic tempeh (or tofu), cubed and tossed with 1/8 tsp. ground star anise, 1/8 tsp. ground roasted Szechuan peppercorns, ¼ tsp. ground turmeric and some kosher salt. Or you can use up leftover cooked meats such as lightly seasoned chicken, pork or duck (lucky you if you’ve got duck! ), cut or shredded into bite-sized pieces. several local eggs, widely available at our farmers markets or maybe your own backyard, beaten thoroughly with a little salt. minced scallions or spring onion greens. Gorgeous alliums galore at our markets and Central Market is selling Texas 1015 spring onions for $1.69 per bunched trio. a couple Tablespoons kecap manis, which I never keep in my cupboard, or dark soy sauce mixed with about ½ Tblsp. palm sugar (I very rarely buy this) or turbinado sugar (now that I always have!) and a bit of ground star anise. Whatever you use, mix in about ½ tsp. turmeric, 1 tsp. ground coriander and a pinch of salt, too. To keep this dish kid friendly, I add 1 tsp. paprika. You can use spicy peppers, dried or fresh, depending on season, to your own tolerance. about a Tablespoon minced fresh ginger root. If you’ve been following this blog for long you know that I almost never peel fresh ginger. Neither did Barbara Tropp when she cooked at home. minced garlic. Lots of local garlic available again! Check out Tecolote Farms at the Sunset Valley location. Small dab of shrimp sauce or paste. I use Lee Kum Kee shrimp sauce, readily available at my work, and it flavors fine for my purposes, although it’s not the same as the more solid shrimp paste of Thai and Indonesian cookery. I bought the little jar and it will probably last my lifetime. Use what you have—if your cooking encompasses Southeast Asian specialties, not only should you already have all the ingredients necessary for nasi goreng, you don’t need my guidance. Carry on! ¼ of a medium-sized head of Texas-grown cabbage (not available much longer this season), halved and sliced thin. In another season, use any stir fry-suitable local veggie, and/or Austin-grown (or homegrown!) mung bean sprouts. If using tempeh or tofu, brown it up in your fat of choice in a large well-seasoned or nonstick skillet. Place the browned chunks on a plate and set them aside. If using leftover meat, toss it with the tempeh seasonings and add it in later. In the same pan, saute your minced scallion greens in a little more fat before adding your eggs. Give the eggs a few stirs as they cook before letting them set into a kind of pancake. I like to put the lid on the pan and turn the heat off so the eggs can finish cooking. Flip the pancake to brown the other side if desired, then turn the eggs out onto a plate and set aside. Combine the minced garlic and shrimp paste/sauce. Heat up some more fat and sizzle your ginger. Add the garlic mixture and stir it around to release the fragrance before quickly adding the onion slices. If you’re using spicy chiles, fresh or dried, add them as well. When the onions are ’bout done to your liking, add the tempeh or tofu chunks (or cooked meat) and stir the mess around. Dump in the rice and continue to fry, breaking up the clumps. Add the kecap manis or soy sauce mixture and stir fry until everything is well-coated with sauce. Turn mixture out onto a large platter. Using a large skillet again (I prefer not to use nonstick for this step), heat the pan up very hot on HIGH. Add a little cooking fat (organic peanut oil is great here) quickly swirl to coat the cooking surface and briskly stir fry the cabbage. Add a pinch each of turbinado sugar, kosher salt and ground roasted Szechuan peppercorns while you’re cooking. Turn the cabbage out onto the fried rice mixture. 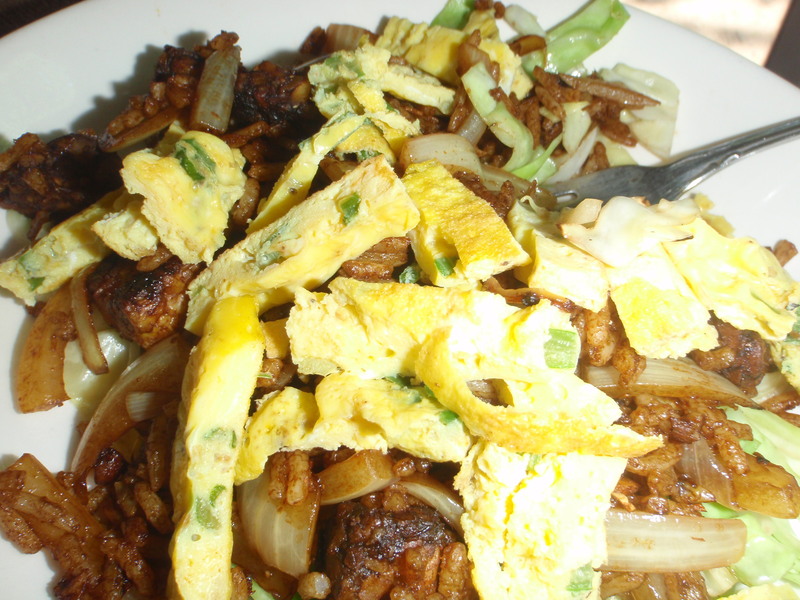 Slice the egg pancake into bite-sized strips to top off the nasi goreng. Let your diners add soy sauce, salt, sugar, a little lemon juice and Asian-style chile sauce to taste to their own portions. 1 meat selection: Anything and everything HEB has. Most of what was available was whole chickens, fryers and pork chops. But we really get everything from pig trotters to ham. We already eat oatmeal almost every morning. 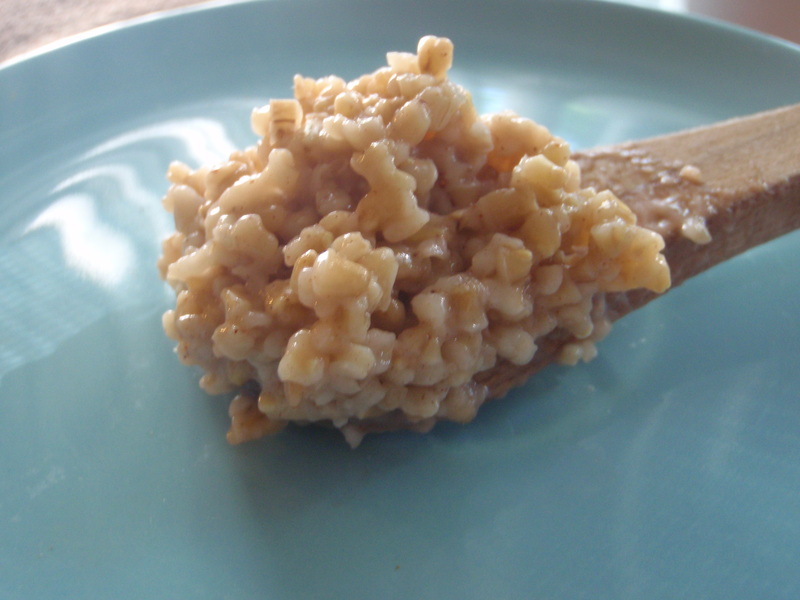 I’ve come up with a method for cooking rolled oats that conveniently yields a less-sticky texture, with the individual oat groats nearly separate. For my two children and myself (my husband’s not on board for this breakfast), I measure a rounded cupful of oatmeal into my pan and turn the burner on to HIGH. I swirl in ¼ teaspoon ground cinnamon and let the oats toast a bit. Then I pour in just over ¾ cup water and swirl the pan to distribute the liquid (do NOT stir to achieve this texture). As soon as I can hear the water steaming, I turn the heat off and let the pan sit there for a couple minutes (my stove is electric). For the fluffiest texture, you can soak and steam the oats over boiling water, but I find my method a texturally-satisfactory compromise. Lactating moms appreciate medium-chain fatty acids so in my normal life of luxury I dollop some coconut oil on top. The kindergartner enjoys honey on his share. A qualifying food pantry recipient’s food stamp benefits, which max out at $50 per week for one adult, may not leave room in the budget for such gilt, but the canned fruit off the list would complement the morning’s porridge. I had stocked up on organic bulk rolled oats, quick oats and steel-cut oats when Newflower Market last had a great sale on those items. We had already eaten our way through the rolled and quick oats (the quick oats I buy for baking but I’ll cook them for breakfast when necessary), and now are working on the steel-cut. In the spirit of the challenge, and frankly, keeping within my own budget, I am trying to hold out on purchasing more oatmeal until another sale comes along. So, steel-cut it is! If you didn’t get a chance to grab a bag of organic russets on sale recently at Newflower Market, Texas farmers have granted you a reprieve. You can find Texas-grown new red potatoes right now at Central Market for $1.99 a pound. No small potatoes for small potatoes, but sometimes you gotta have your spud fix. Either way, boil up some ‘taters for this comforting casserole and store any extra boiled potatoes in the fridge for quick breakfasts. This dish used up my leftover cottage cheese (from Mackin’ Cheese) and incorporates fresh Texas cool weather produce, still available for a little while longer. Serve as is or gild with your favorite salsa or a tangy tamarind chutney. 4 medium-sized cooked potatoes, or 9-10 new potatoes. I boil up a few and keep ’em in the fridge for quick starching. 1 teaspoon garam masala. You can use your favorite recipe, or try this basic blend. Or you can buy it ready made in bulk spice departments. 4 Tablespoons plus ½ Tablespoon ghee or organic butter (click for a coupon on Organic Valley), plus more for greasing you baking dish. Click for my instructions on making your own ghee. 1/8 to ¼ teaspoon asafetida, optional but yummy. 1 10-ounce bag of Cora Lamar’s triple-washed Texas-grown spinach (ready to cook) or other local spinach, trimmed and cleaned. ½ teaspoon plus ¾ teaspoon salt. I use Real Salt. Plus some kosher salt for the potatoes—I like Diamond Crystal. 1 cup organic or local cottage cheese. I used Organic Valley. Full Quiver Farm sometimes makes cottage cheese. Ask at their booth the next time you’re shopping Austin Farmers Market or Barton Creek Farmers Market. Combine the ground spices, paprika through the garam masala, and stir in 3 Tablespoons water. Heat up a large saute pan with the 4 Tbls. 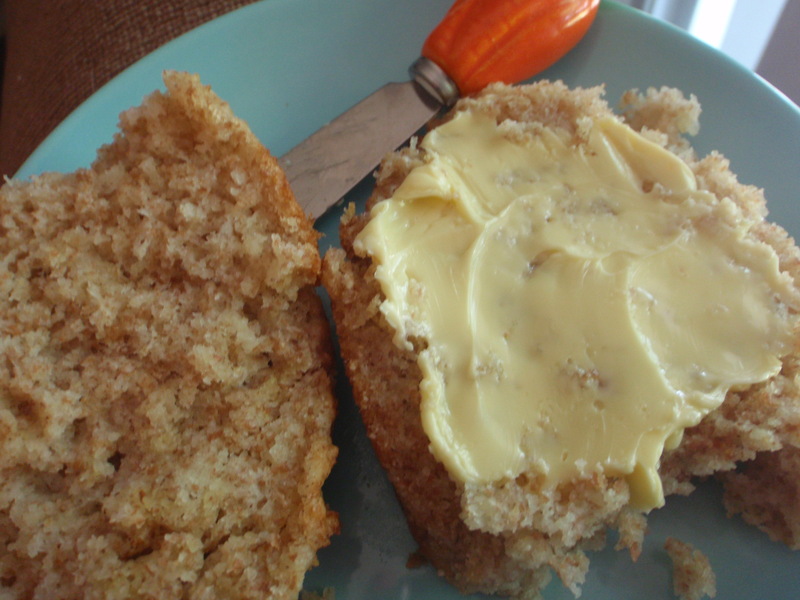 ghee or butter. Add the asafetida and give it a quick stir before stirring in the spice mixture. Cook and stir over medium-high heat for a minute or two, until the spices begin to look dryish and separate from the butterfat. Stir in the leeks to get them well covered with the spices and add about 3 Tablespoons more water. Saute, stirring and adjusting the heat as necessary to prevent scorching, until the leeks have softened. Stir in the garlic to release its fragrance. Break each potato into two halves (unless they’re small) and smash each spud into coarse chunks with the heel of your hand. Add the ‘taters to the cooking pan as you go. Stir the mixture well to get all the potatoes covered with the seasonings, sprinkle them with a good pinch of kosher salt and let them sit and brown for a couple minutes. Stir and salt again and let brown some more. Turn the potato mixture into a bowl. 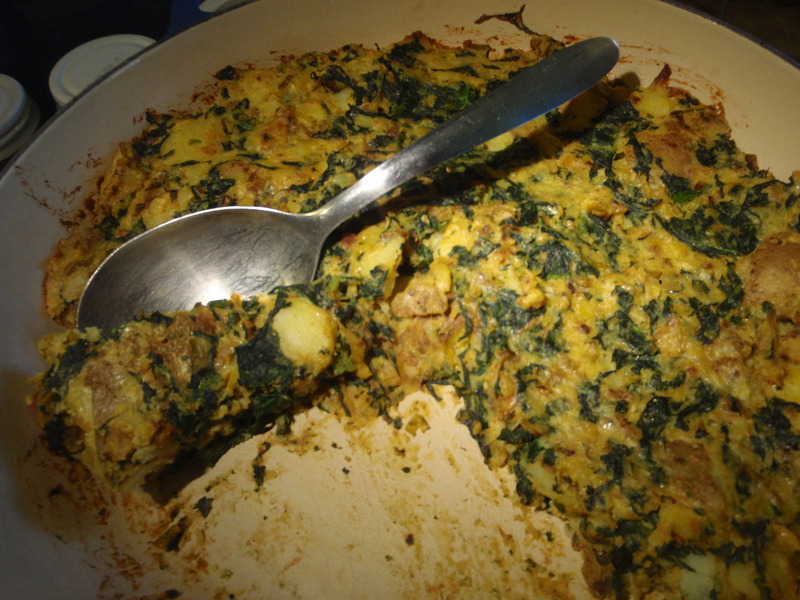 Heat up the ½ Tablespoon ghee or butter in the same pan over high heat and wilt the spinach. Place spinach on a plate to cool for a minute before chopping it up and pressing most of the liquid out. You don’t have to squeeze it totally dry. 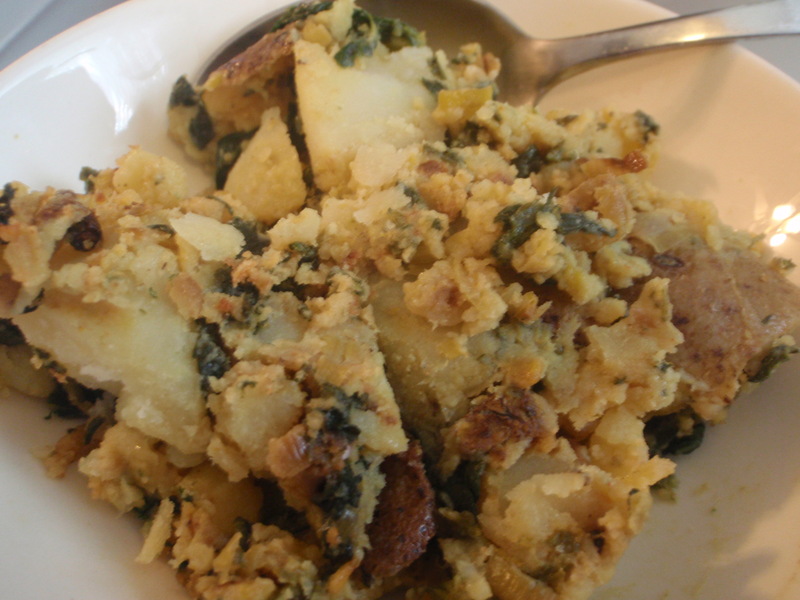 Mix the spinach into the potatoes. Meanwhile, combine the cottage cheese, egg, ¾ teaspoon salt and cilantro in a small food processor bowl and process until smooth. Stir the cottage cheese into the potato mixture. Scrape into a large buttered casserole dish (I used my 3½ quart Le Creuset “buffet casserole”) and bake at 400° for about 20 minutes, until piping hot and steaming in the middle when stabbed with a butter knife. It certainly wouldn’t hurt to serve this with some juicy grilled local sausages, such as Dai Due‘s fat and juicy spicy wild boar sausage. Already ate your crispy salt pork or crunchy bacon but still have plenty of yummy pig grease? And whatcha gonna do with all those eggs you bought for Easter? If you haven’t dyed them all yet, bust out a pound of spaghetti—I stocked up when Central Market had their own brand on special last month—and whip up a cheap meal of spaghetti alla carbonara. Nobody around here doesn’t like noodles, pig fat and cheese, so this Roman-style classic is a sure-fire winner. And if that’s not enough fat for springtime, take the softened butter that you didn’t finish up with your holiday rolls (CM’s brioche dinner rolls are on sale for $2.99 a dozen and they do rule), mix in a bit of Dijon mustard (or whatever mustard you got) left on the knife from dressing your after-school-snack Kocurek frankfurters, and swipe it with your freshly plucked radishes for a fancy treat. Enjoy a few new local strawberries—(from Barton Creek, Sunset Valley or Austin farmers markets) and a late-season grapefruit for dessert and there’s your whole meal. 1 pound organic spaghetti. Central Market and Whole Foods own brand are good values. dash of organic or Texas olive oil, optional. For organic I love Spanish Villa Blanca. Check out Texas’ own Texas Olive Ranch at our local farmers markets. 3 ounces finely grated Parmigiano-Reggiano, or 2 ounces Reggiano plus 1 ounce Pecorino Romano. Get your big pot of water going to cook the spaghetti. I’m not gonna try to tell you when to salt your pasta water but I always salt it at the beginning. Meanwhile, heat up your fats and saute the onion with a pinch of salt until softened. Stir in the garlic to release its fragrance, then add the wine and boil it off. In a very large bowl, stir the eggs and cheese together briskly until emulsified. When the spaghetti tests done, dunk a glass measuring cup into the pot to reserve about ¾ cup of the cooking water. 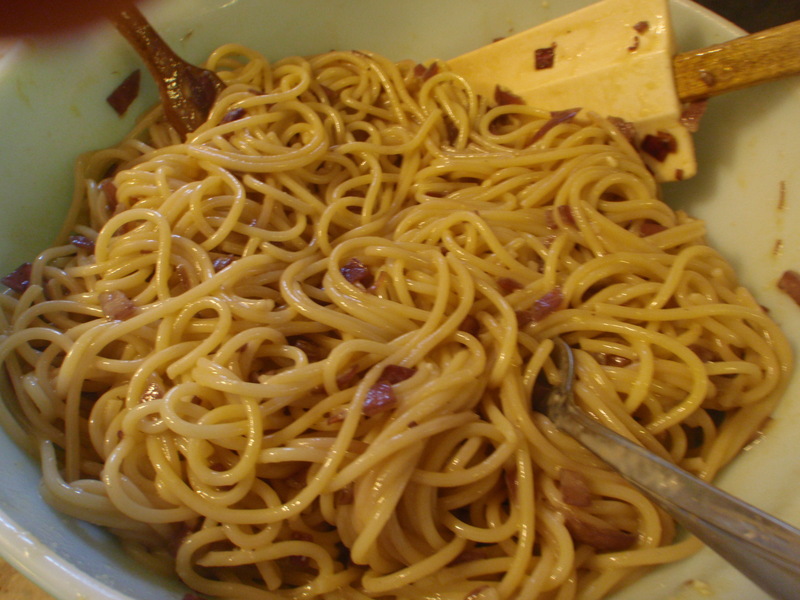 Add the pasta and the onions to the eggs and toss well with two large forks to mix it all up. Splash in the cooking water as needed to create a creamy, emulsified sauce. You may not need all the water. Season with plenty of freshly cracked black pepper and top each serving with a nice flaky salt (such a Murray River salt flakes), to taste.